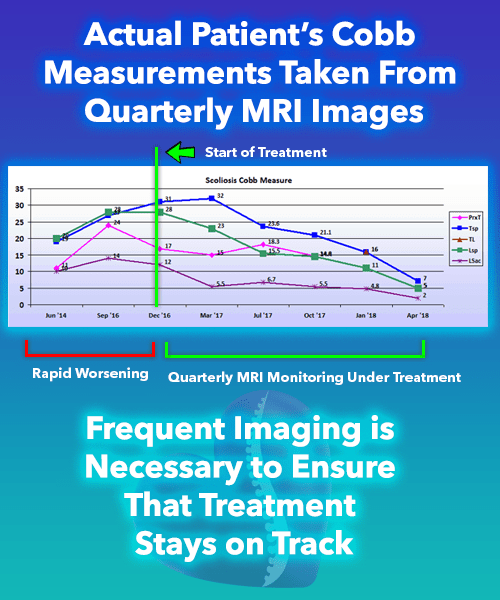 We obtain spinal scoliosis MRIs of our patient’s Cobb angle measures every three months. Because scoliosis can worsen in a matter of months during a growth spurt, there is a critical need to be able to see the spine and measure the Cobb angle frequently in a growing spine. 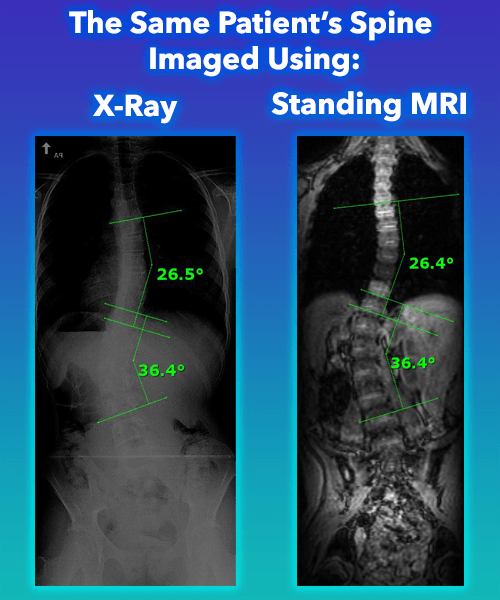 These MRI images are performed in the standing position and out-of-brace in order to measure whether the curve is holding, growing worse, or growing straighter. The Cobb angle measure is then plotted on a graph and tracked so that every patient can see, at a glance, the progress of their scoliosis. The chart to the right is a classic example of the limitations of X-ray imaging. 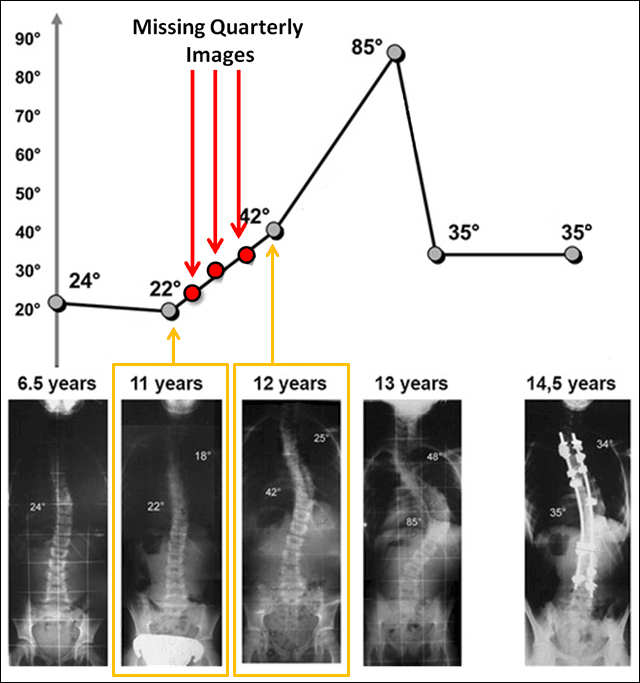 This 11-year old child had a 22 degree Cobb angle that progressed by 20 degrees into surgical range in just one year. If the scoliosis was being monitored quarterly (demonstrated by the red arrows) with standing MRI, the progression could have been avoided or even reduced! Instead, a whole year went by between X-ray images to avoid overexposure harmful radiation. The Silicon Valley BraceTM is uniquely designed to be MRI safe. We measure how well the brace is correcting our patient’s spines every quarter. This allows us the unprecedented opportunity to frequently assess brace performance without radiation. 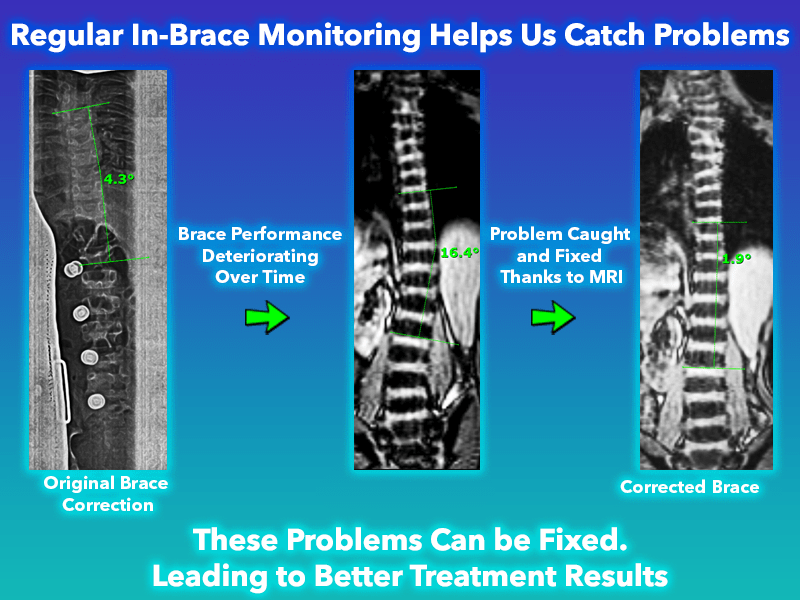 These scoliosis MRI images allow us to catch changes in brace fit that may be detrimental to the patient’s improvement. Problems with the fit of a brace are inevitable as patients grow, change in body girth, and the spine grows straighter. By catching problems with brace performance the moment they begin, changes can be made to the brace that allow us to ensure a patient continues to grow straighter. Key treatments, such as the initial design of a Silicon Valley BraceTM, are also guided with Standing MRI. Upon first fitting a brace to a patient, the effect of the brace on the scoliosis is immediately measured with the patient wearing the brace while in the MRI machine. By using this feedback obtained from the MRI images, final touches can then be put on a brace to maximize our in-brace correction. Since MRI is radiation free, this process can be repeated as often as necessary to perfect a brace design. Other treatments we prescribe at Scoliosis Care CentersTM are also measured for effectiveness in this way. 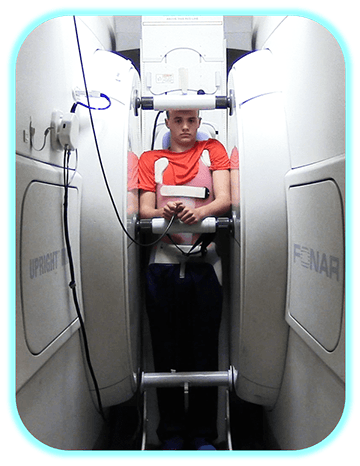 Circumstances may exist whereby a treatment or a patient cannot be tested using standing MRI. 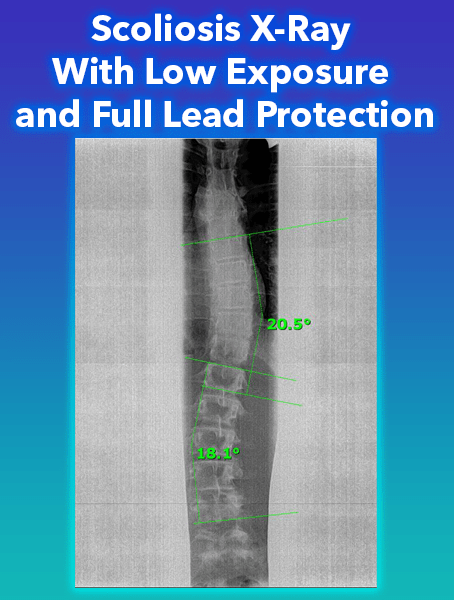 In such cases, we practice low dose X-ray techniques to minimize exposure to our patients. Unlike many facilities, a careful count is kept of total X-ray exposures so that we can assure they are kept to an absolute minimum. What is your relationship to the patient with scoliosis? Where are you in the world? Where is the patient located? © 2018 Scoliosis Care Centers – Janzen & Janzen Chiropractic Health Center Campbell, CA.